Merry Christmas! I wasn’t going to post for a little while, but I’ve made some progress on my Stark’s paint scheme, so here’s an update. 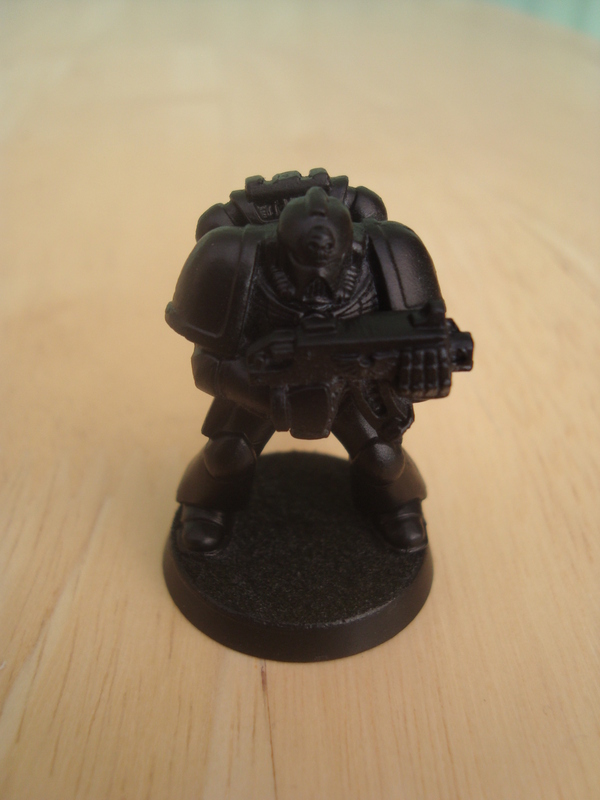 I’ve had some ideas on paint schemes, but before committing to painting any of my old Rogue Trader models, I’m using one of the snap-fit Tac Marines from the 2nd Ed box set. Next I did a base coat of Dark Steel. This is a roughly 50/50 mix of black and Boltgun Metal. I got the idea from this video. Stupidly, I didn’t take a photo at this point! The next step is a coat of Nuln Oil. 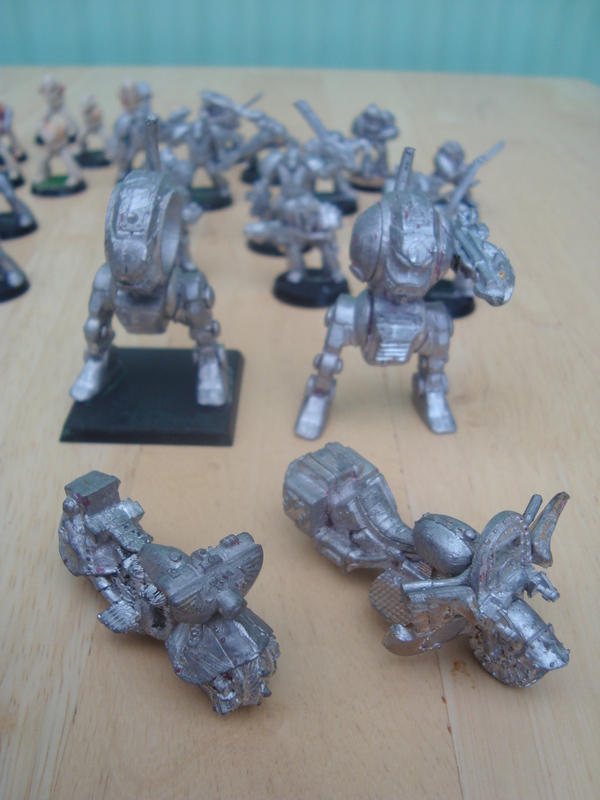 I’m wondering at this point whether I could have just done a straight Boltgun Metal base coat, rather than ‘Dark Steel’. Might try that on another model. 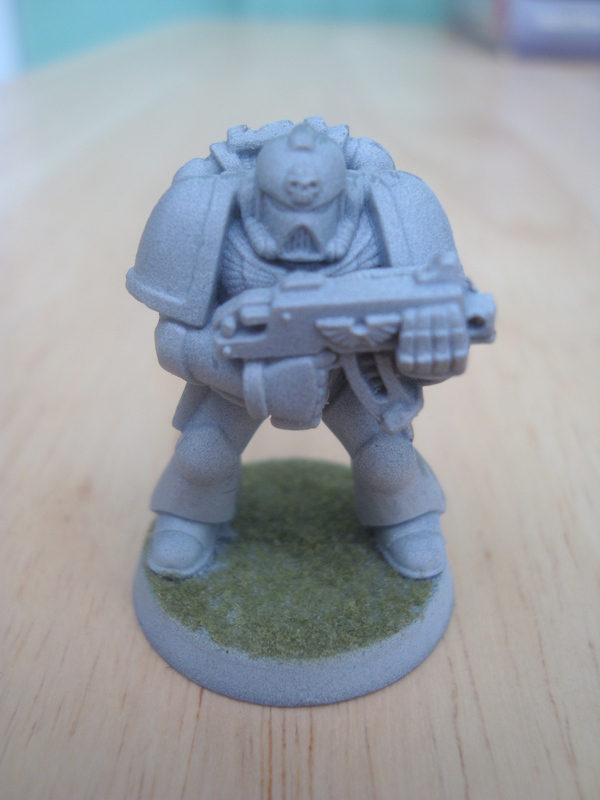 So that’s given some depth and shadow to the model, the next step is an ‘overbrush’ in Boltgun Metal. 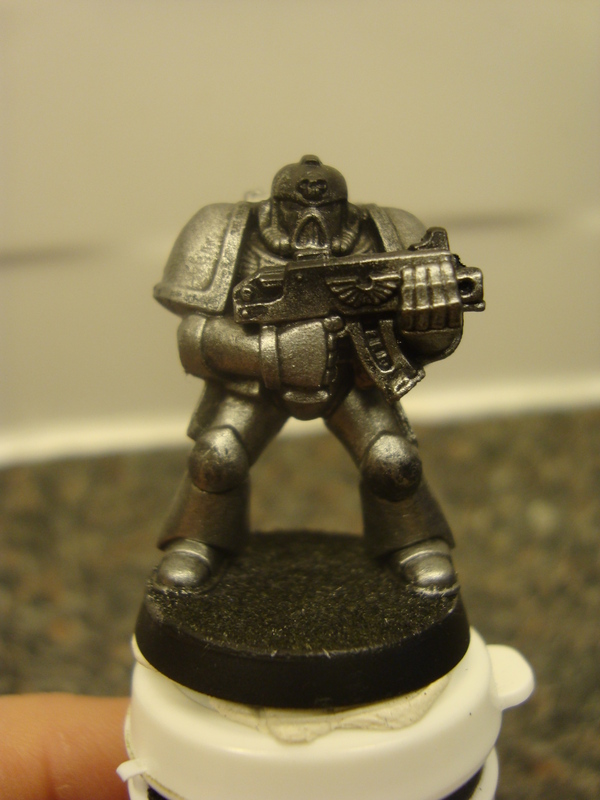 This is heavier than a drybrush, effectively giving the model a coat of Boltgun Metal, without getting into all the cracks, leaving the darker Nuln Oil in those parts. Sorry for the crappy photo, it was late so no natural light and I wanted to crack on with the next coat! It doesn’t show a fair comparison of colours. Finally, a highlight of Mithril Silver (or whatever GW are calling it today). This is quite heavy, as it goes on quite nicely over the Boltgun Metal – you can’t see the transition from one colour to the next. That’s the main armour colour sorted, next is the red. 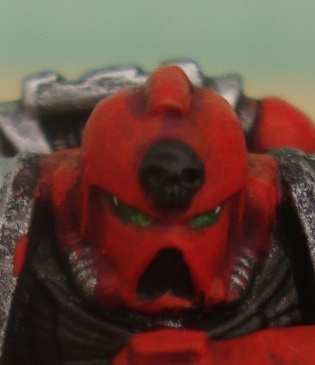 Red is the chapter’s secondary colour (tying them in to their friends the Ad Mech, back on Mars!) and I want to do the knees, helmet, parts of the backpack and the guns with this. I started with Red Gore (Wazdakka Red in new money), a quite dark red, then washed with Carroburg Crimson, then an overbrush of Blood Red (Evil Sunz Scarlet). 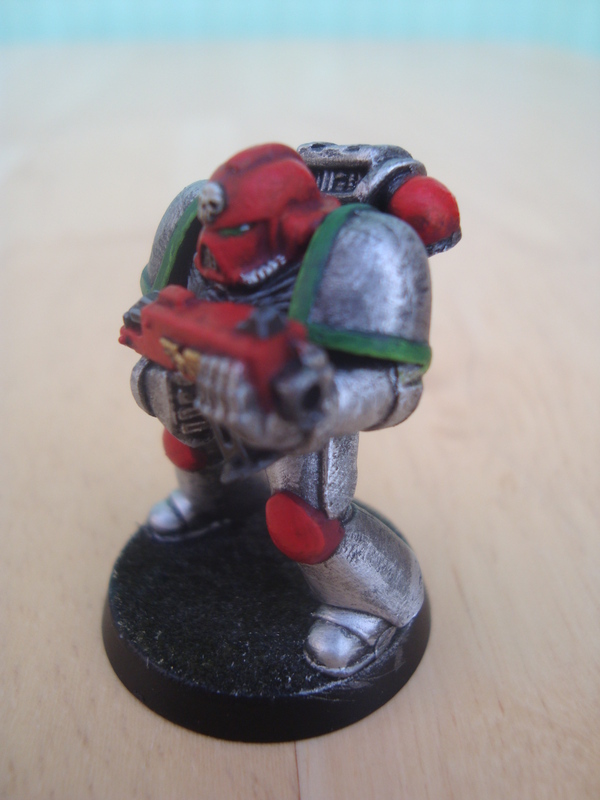 In places I then followed up with another highlight in Blood Red, for example on the edges of the gun, to make it stand out a little more. It looks okay, but I think I might start with a lighter red as the base coat, maybe Mephiston Red. 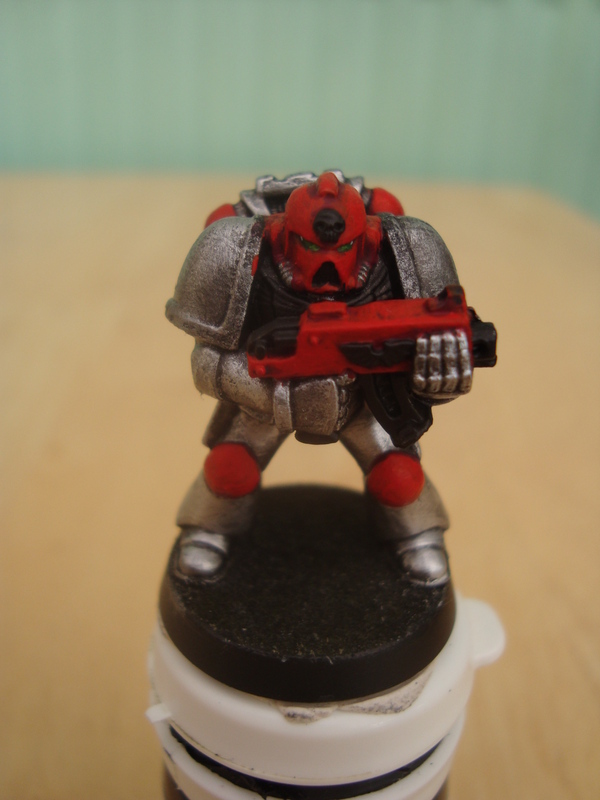 The wash is enough to darken it down before the Blood Red highlight. 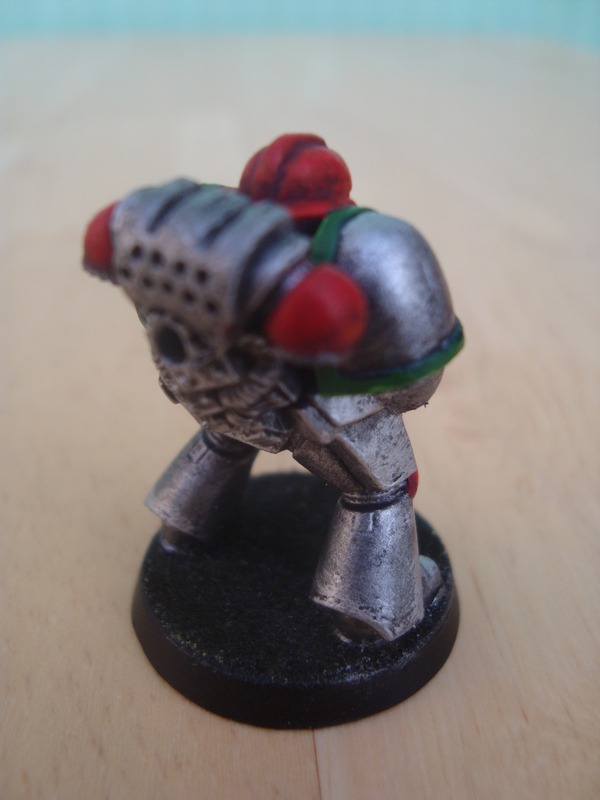 It also needs more red on the backpack, as the model is too bland from behind. Now the eyes. I wanted a contrasting colour here, so have gone for green. Dark green (Coat D’Arms Dark Elf Green) first, then Snot Green on the front half of the eye, then a touch of Scorpion Green right at the very front. Finally, a white dot at the back of the lens. It’s the first time I’ve gone to this level with eyes, and I’m pretty pleased. Not sure if I’ll be able to keep that up over 70+ models though! 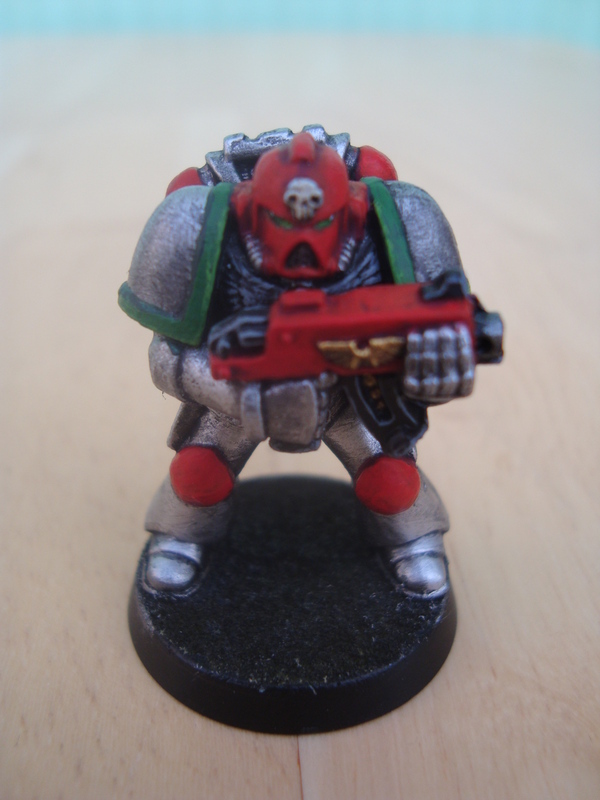 For the rest of the model, I’ve done the skull on the helmet (brown, then Bleached Bone, then a touch of a white highlight), a gold aquila on the bolter (gold, then a sepia wash, before a gold highlight), edge highlighted the bolter’s black parts with grey and trimmed the shoulder pads in green. 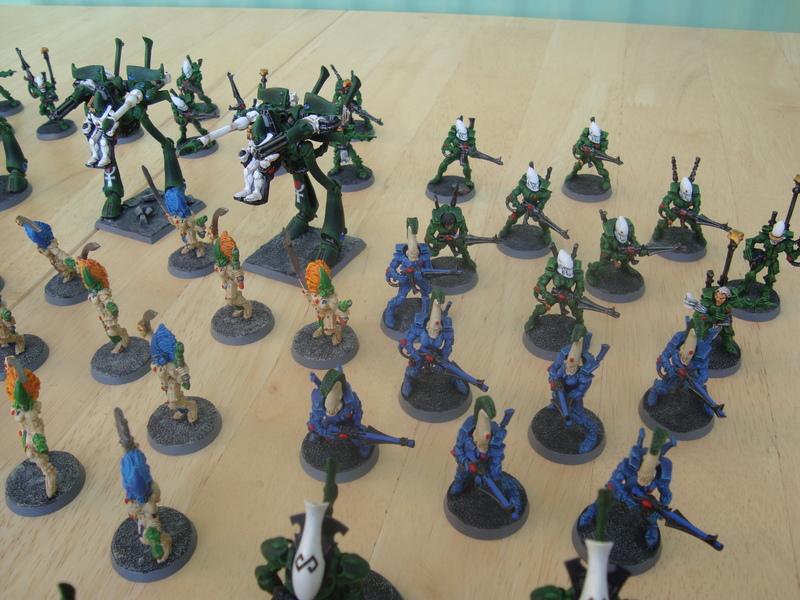 My plan was to have different colour shoulder trims for Tactical, Devastator and Assault squads. 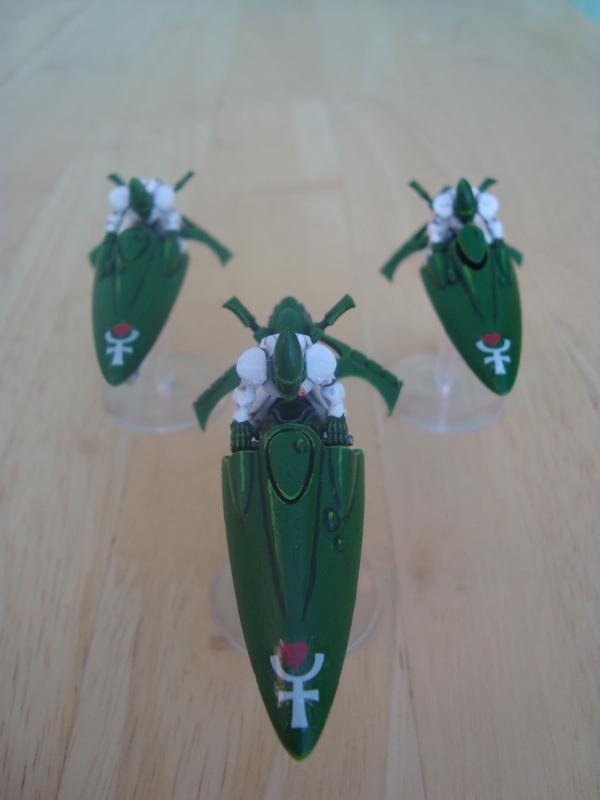 But now I’ve done one in green (the others were going to be blue and yellow), I don’t think it works with the red and silver. 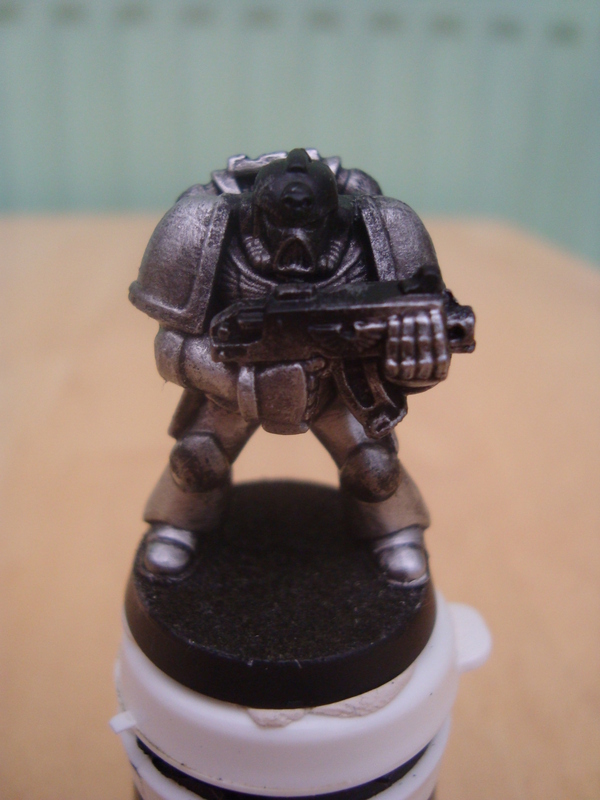 I’m now thinking of doing the shoulders black, with the trim in the same silver as the rest of the armour. There’ll be no difference between squad types. Overall, I’m happy with the colour scheme, just want to add more red to the backpack and change the shoulders. 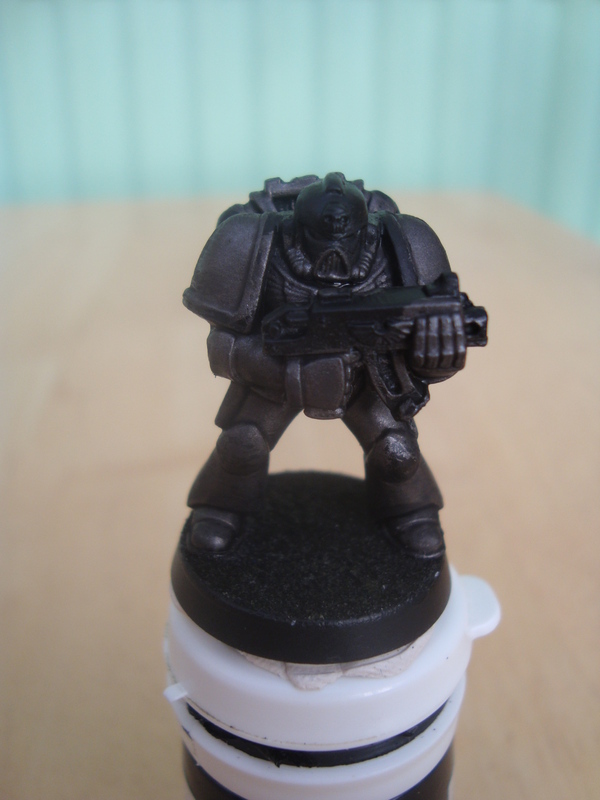 I then need to figure out what symbols I’ll use on the shoulders, and whether to use transfers or green stuff. I’m tempted with green stuff, but need a design first! Might need to add something to a knee as well. 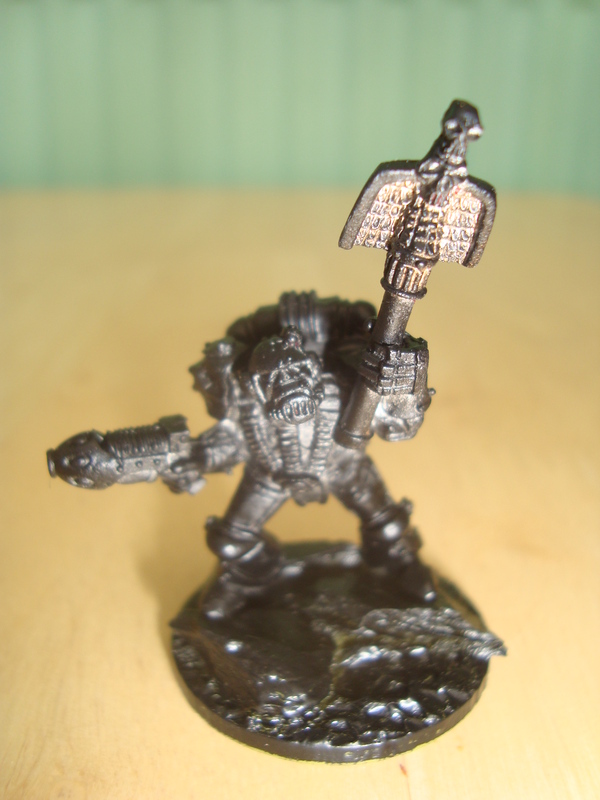 And as promised, here’s the next installment in my Stark Crusader fluff – my Chaplain. Khamsin saw the monstrous ork towering over the prone Stratos and instantly reacted. He saw it all too late to prevent the ork striking, but seconds later was leaping through the air, screaming incantations of war. As he descended like a hammer from the gods, plasma spewed forth from his pistol and his weapon of office, the ancient crozius, swung down from overhead tearing into the back of the ork’s armour. This strike, suddenly leaping through the air like an airbourne storm of death, had become Khamsin’s trademark attack, so often had he appeared as if from nowhere, at a critical point in the fighting. The impact of the blow forced the cumbersome ork to the ground, where Khamsin stood atop him, still bellowing incantations, amplified by his helmet – a bone white skull designed to strike fear into those facing him in battle. Whilst pumping searing plasma into the back of the ork’s armour, the Stark Crusader chaplain crushed the life out of the ork with repeated blows with his crozius to the xenos’s green head. The encounter lasted only seconds before the ork was still. Khamsin glanced at the remains of the young sergeant. He was a bloody mess – limbs clearly dislocated and broken in many places, his face and head smashed – but there was still life there. Thalius was close behind, and Khamsin had seen the apothecary work miracles replacing weak flesh with metal augmetics. The sergeant would fight again and would be stronger than ever before. Merak Khamsin had overseen the spiritual guidance of the 3rd company for centuries, and had seen every living Stark in the 3rd go through selection, training and battle. Many he had seen butchered in war, only to rise like mechanical Phoenixes after being patched up, augmented with metal, and implanted with bionics. Across centuries of war he’d seen Astartes in worse shape than Stratos fight again, but not much worse. This had been the bloodiest and harshest war the chaplain had seen in centuries. Not since the war against the vicious tyranid monsters swarming the cold worlds of Handolax had Khamsin seen such huge losses. That war had been a victory and the system had been cleansed of the filthy xenos, but at great cost. He was confident the war here on Ska’garath IV would end victoriously also, but the company would need time to recover. His skills in guiding the chapter’s spiritual wellbeing would be greatly tested in the following months. 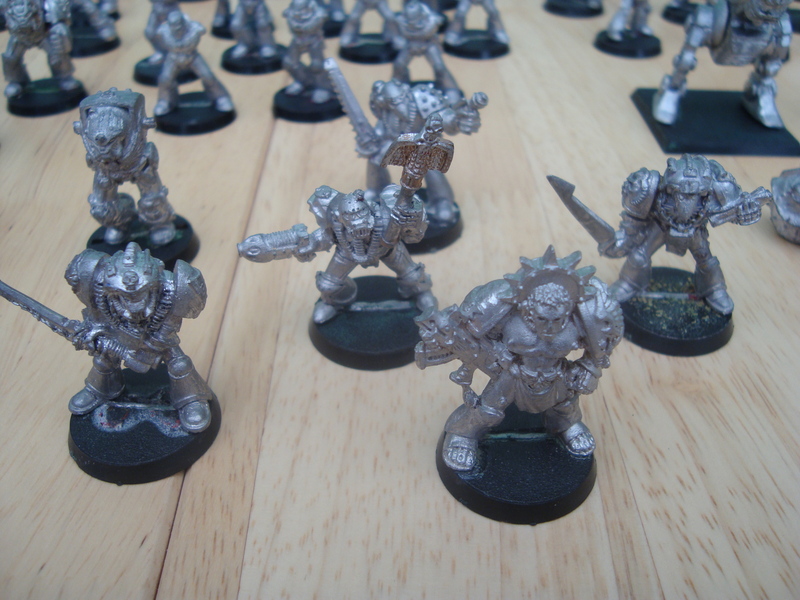 You’ve seen how my Starks started life – as Blood Angels – but now they’re mostly stripped of paint and ready to be re-branded! There are a few still sat in Fairy Power Spray because I’ve not got round to cleaning them up. Other than that, it’s just the Rhino, Land Raider and Razorback that need to be done. I don’t think I have enough FPS and they’ve changed the formula, so I can’t get any more!! Not sure what I’ll do with them. Probably need to get some Biostrip 20. I’m going to put all my independent characters onto 32mm scenic bases, to help give them the visual appeal they deserve! The dreadnoughts are also going onto scenic bases, probably 50mm. 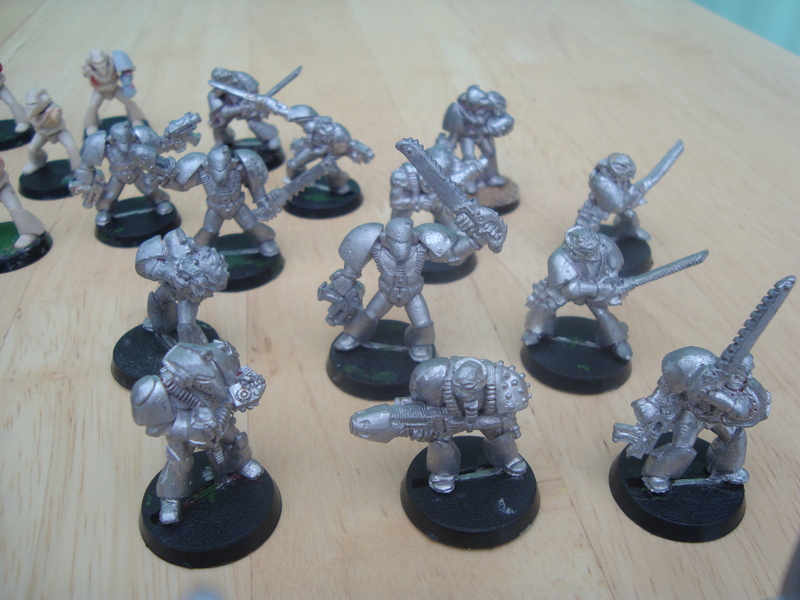 All the terminators will be upgraded to 32mm bases, as will some of the marines. 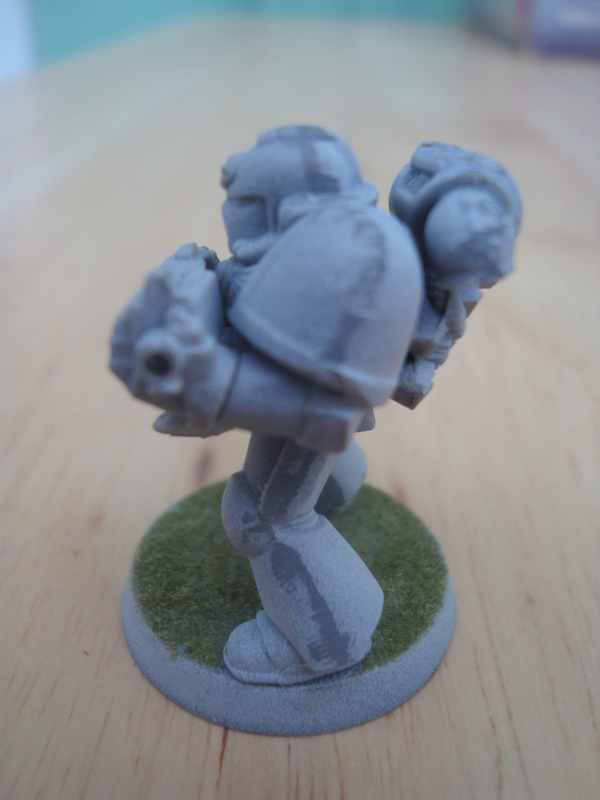 Any that look chunky, like the Devs, will go onto 32mm, but the smaller ones, especially the Mk VI ‘beakies’ will stay on 25mm, otherwise they’ll look lost! As I make (probably slow) progress on the Starks, I’m also going to add the background fluff I’ve written for the army. I started by just making some notes to give the chapter and characters a bit of background, but it started to take on a life of its own! You can find all the fluff on my Starks page, which will be updated as I post more stuff, but below is the first installment – Captain Lando Stratos. Looking forward to getting my classic RT dreads up and running! The Stark Crusaders 3rd Company had been ridding Ska’garath IV of greenskins for nine months. It had been a relentless and brutal campaign against a massive ork warband and both sides had taken heavy losses. Lando Stratos’s kill rate had seen him rapidly recognised as a fearless warrior and the high attrition of marines resulted in his battlefield promotion to squad sergeant of the 4th Tactical Squad. That had been just eight days ago. There hadn’t been time for a formal ceremony or even a chance to speak with the captain since his appointment as sergeant, and now it was all over. Despite single-handedly slaying two ork behemoths in massive, thickly plated suits of tank-like armour with blasts of searing heat from his boltgun’s secondary meltagun barrel, Sergeant Stratos wasn’t equipped for the vicious close combat assault of these huge walking tanks. His squad were providing covering fire but their bolter rounds were ricocheting harmlessly off the final ork’s armour and it continued to advance. Stratos was too close and couldn’t retreat to cover quickly enough. He was quickly floored by a swipe of the ork’s giant fist, electrical energy sparking over its surface. Now the giant had him pinned to the ground with a single huge foot to the chest. Stratos could feel his generically enhanced, bone plate ribs cracking, hissing gases were pouring out of the multiple breaches in his failing power armour, life support systems were beeping loudly in his ears indicating imminent failure. He was already dying and now the xenos warrior was swooping down for the killer blow. Stratos’s lungs shut down, his vision was darkening and all he could think about was how he’d failed his squad, failed the Starks, failed the Emperor. The ork’s fist, the size of a dreadnought’s fist, crackling with blue flashes of energy, came crushing down on Statos’s face, ripping it off and shattering his skull. His eyes were still closed, but everything was so bright. Everything hurt. Even his genetically enhanced Astartes body was struggling to cope with all the damage that had been done. But as Lando Stratos regained consciousness, he realised he was still alive, pain confirming the reality. He tried to open his eyes, but only one obeyed his command. The pain was incredible. He could make out the shapes of medicae servitors, he was surrounded by medical equipment and monitors, he must be back on one of the Stark’s medical frigates. A weary looking apothecary wearing a blood-stained tabard approached, but Stratos slipped back into unconsciousness. It was three weeks since Stratos had first briefly regained consciousness, and ten days since he’d been able to leave the medi-deck, although he returned every day for more treatment. The pain was reducing by the day and he’d regained most of the mobility in his legs. His left hand and lower arm was now metal, but he was already using a bolt pistol effectively with it. Accuracy was improving each time his visited the practice range. What was difficult to get used to was his new face. 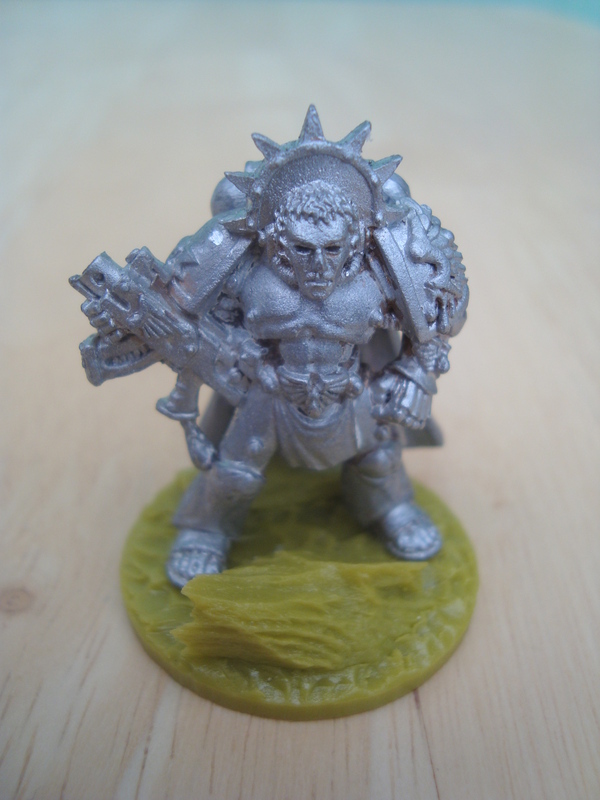 The ork had removed Stratos’s face and destroyed half of his skull. This had all been replaced with metal. He only had one organic eye, his second being an augmetic that was better than his original – better night vision, better range, better clarity, better in every way. He’d been rebuilt in just a few days by the apothecary, now he needed to get used to his new body, full of augmetics, so he could lead his squad once again. The flesh is weak. They all said it, they all meant it, and plenty of Stratos’s brother Starks had hands, arms and legs replaced with metal. But never had it hit home just how true that was. The flesh is weak. His body hurt, but only the organic parts. None of the metal hurt. The flesh is weak. His new arm is stronger. The flesh is weak. His new face is tougher and his new eye is better in every respect. The flesh is weak. He won’t be felled so easily next time. He’s stronger and quicker now. He has an opportunity to make up for his mistake. He can lead the 4th Tactical to glory and serve the Emperor. His body won’t fail him again. The flesh is weak. Over the next century, Sergeant Stratos would indeed lead the 4th Tactical to glory. They became the 3rd Company’s most infamous and feared unit, repeatedly succeeding against all odds. Inevitably, Sergeant Stratos was promoted to Captain Stratos, leading the 3rd Company to even more impressive victories and glories. 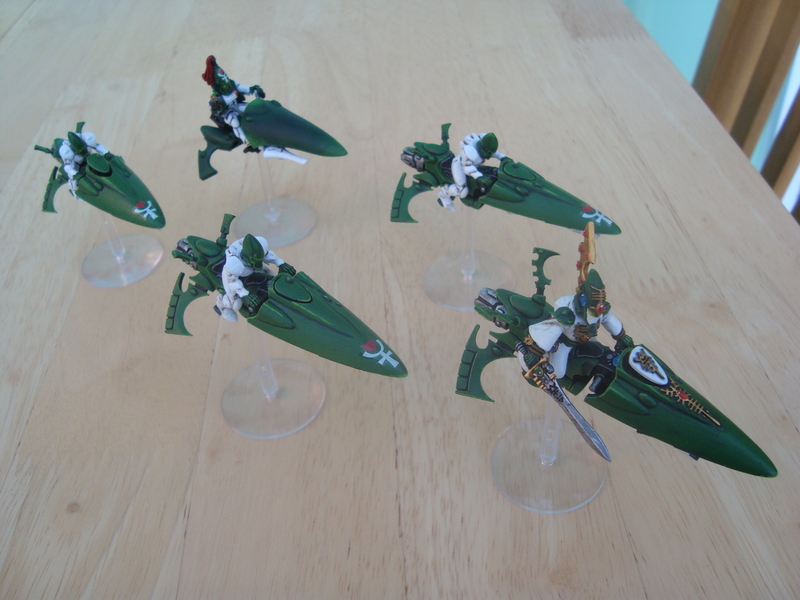 I’ve finally ‘finished’ my Biel-Tan Eldar army. I say ‘finished’ because obviously these things are never actually finished. 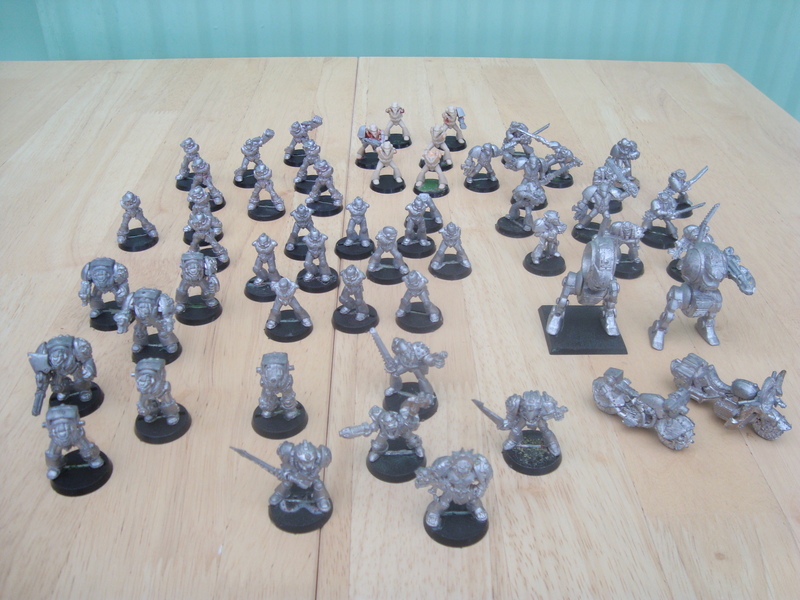 I’ve still got some unpainted Scorpions, Rangers, Guardians and Dire Avengers, but for now, this is my complete army. 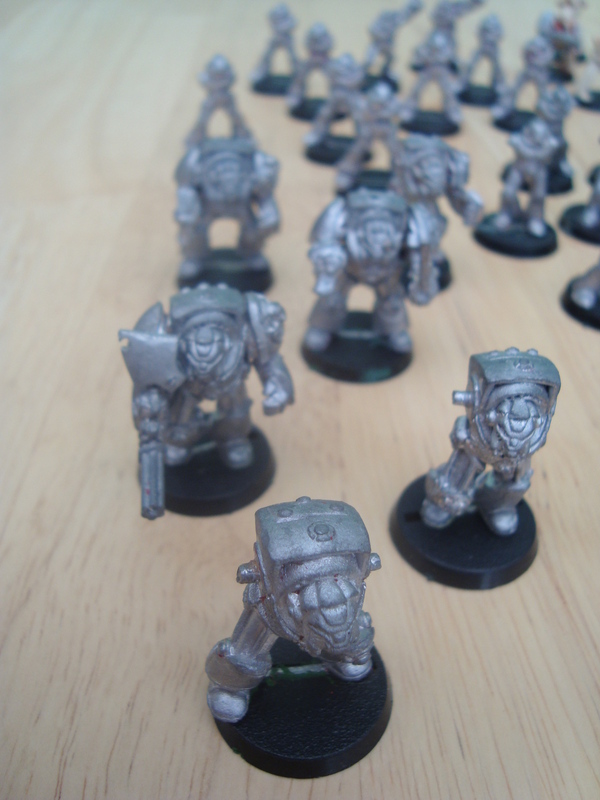 I’m moving onto my Space Marines now, so I’ll get back to the unfinished stuff if I find I want to use them. I prefer fluffy armies, which in this case for me means lots of different aspect warriors, and no spamming units. 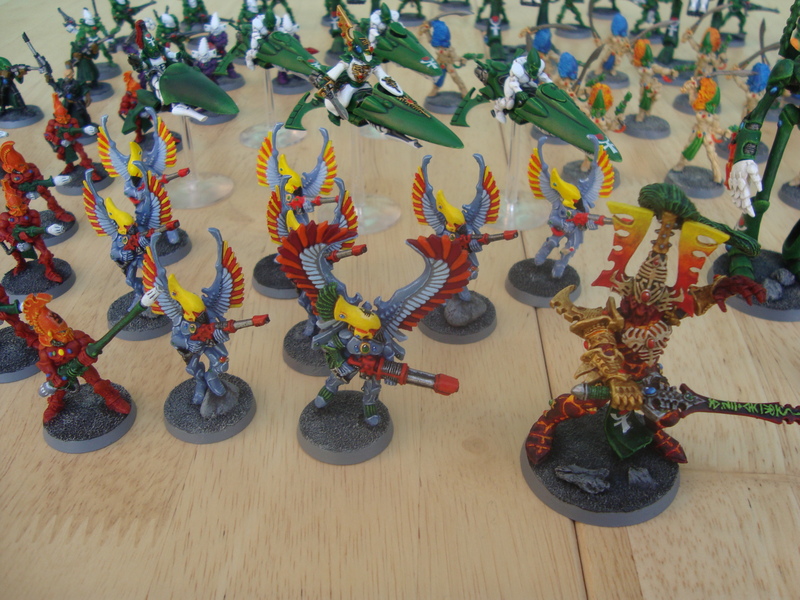 That’s why I’ve only got 4 Windriders and a Jetseer (and don’t expect to see a Wraithknight any time soon!). 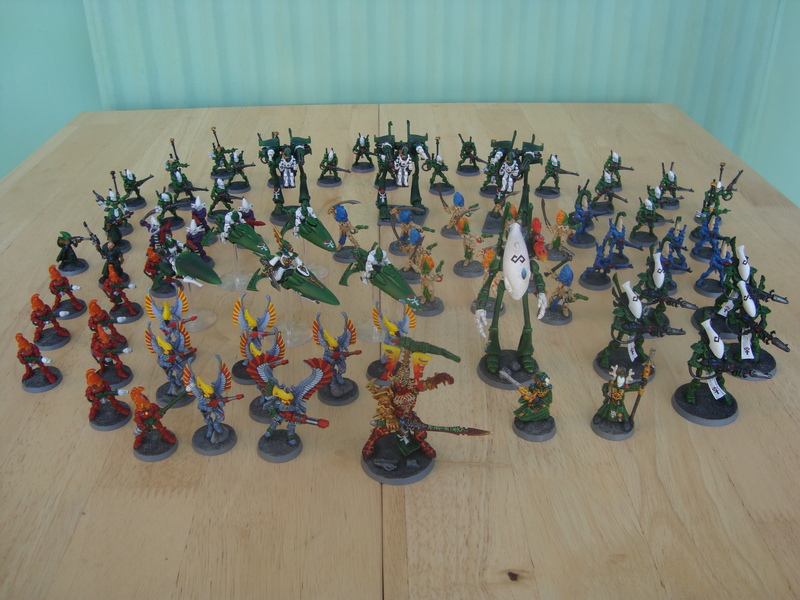 I much prefer a mix of different types of units, which Eldar lends itself to well with all the aspect warriors. Avatar, Swooping Hawks and Windriders lurking in the background. 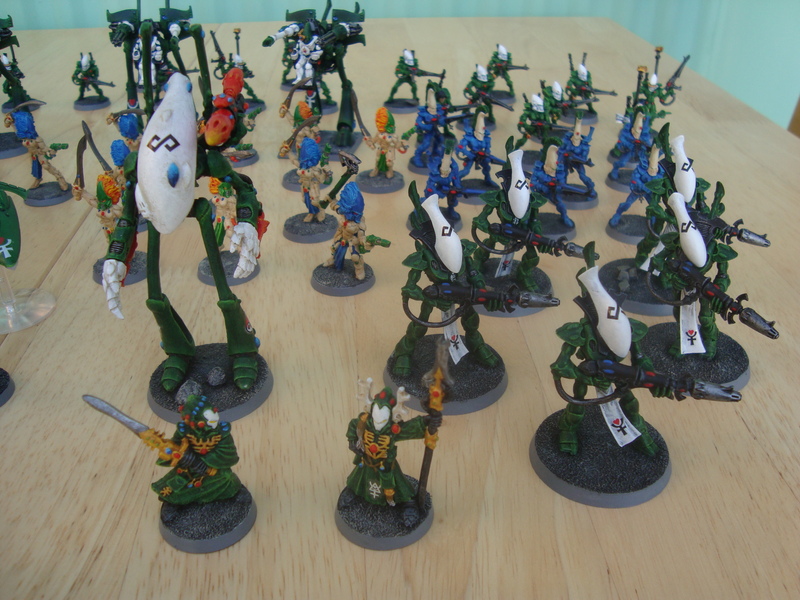 My ‘wraith host’ – the Wraithlord and Wraithguard, with a couple of Warlocks. The Windriders, with War Walkers bringing up the rear. 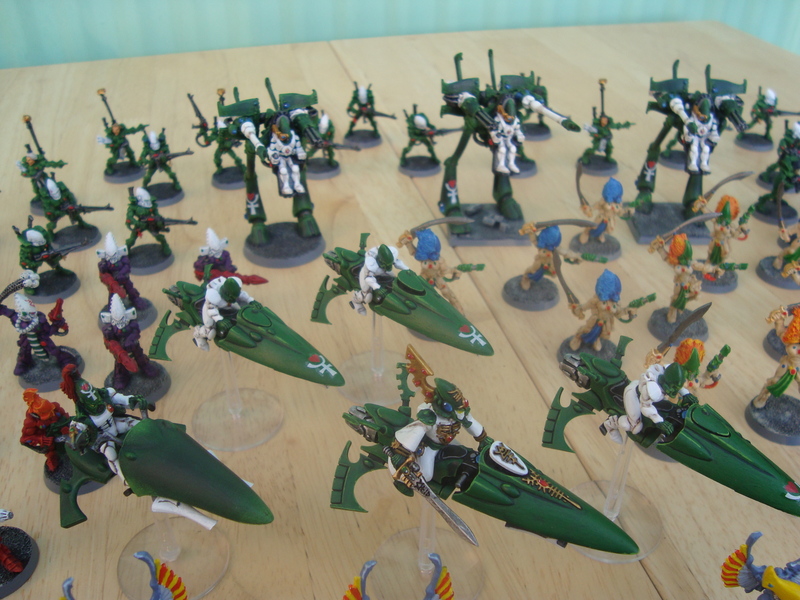 Dark Reapers are skulking just behind the jetbikes. Dire Avengers, Howling Banshees and Guardians. 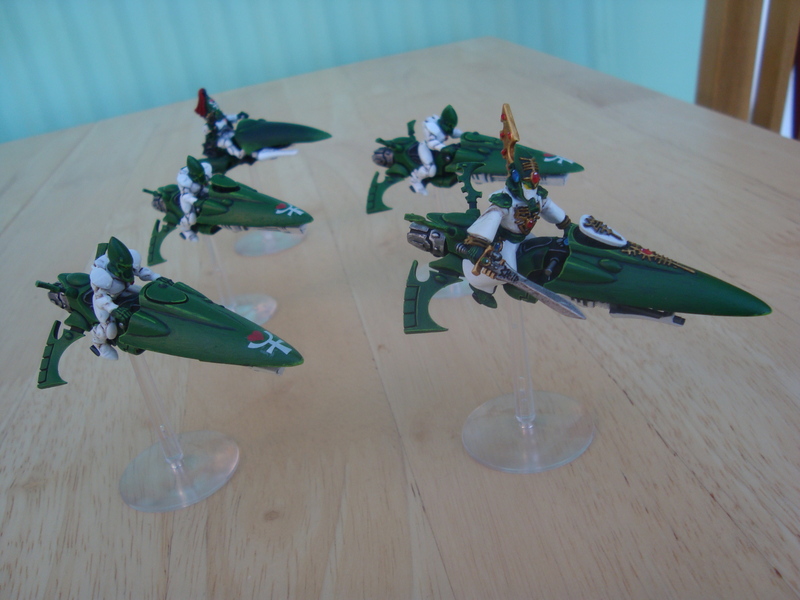 The jetbikes were the last to be finished. 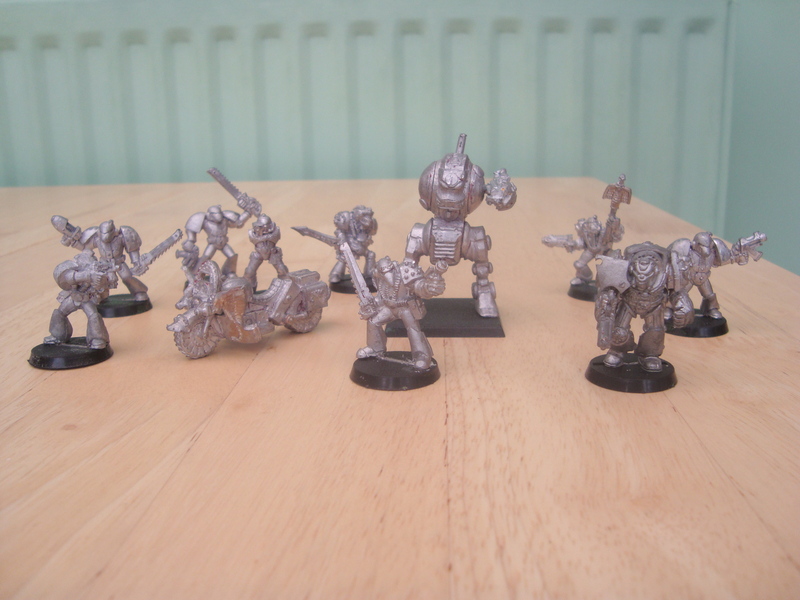 They’ve made a few guest appearances here when I’ve written about magnetising, but they’re finally finished! 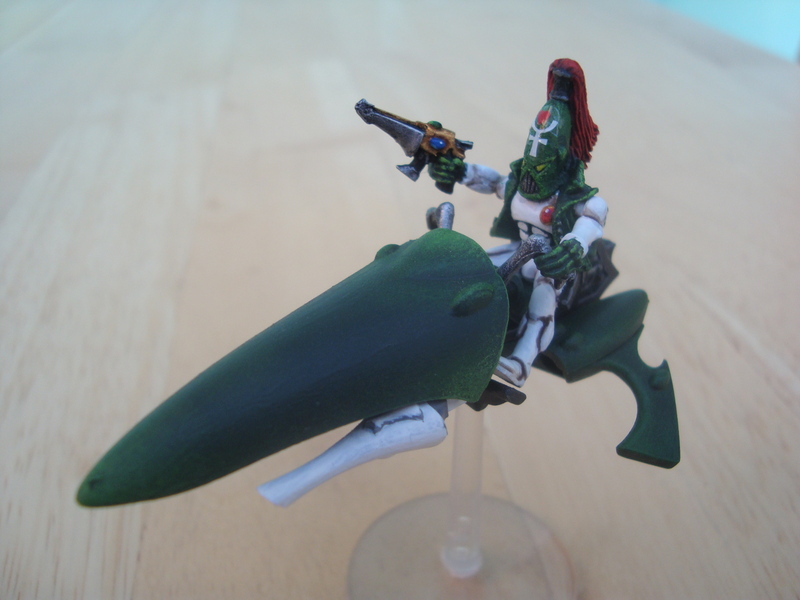 All weapons are magnetised, as is the Autarch/windrider body on the old jetbike, and the head of the farseer/warlock. Farseer Skyrunner (with swappable head for a Warlock and arm for Witchblade/Singing Spear). 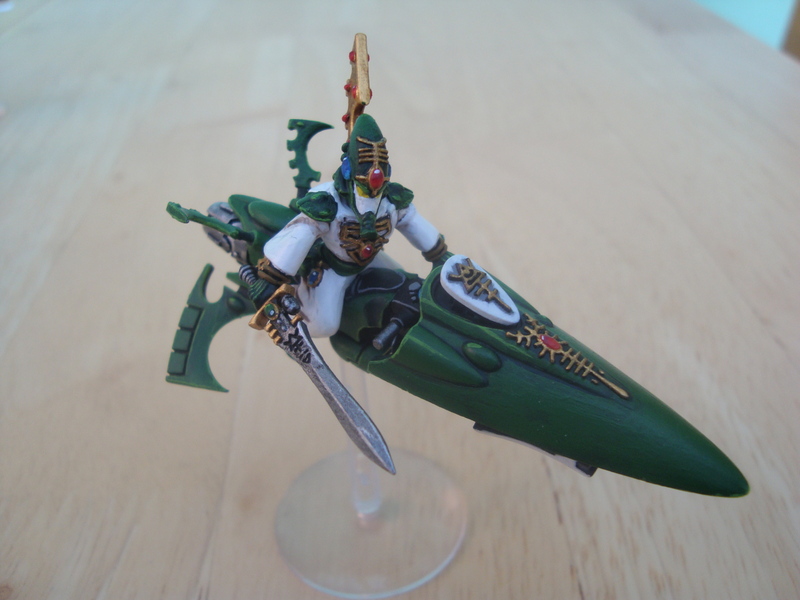 The Autarch Skyrunner’s body can be swapped out for a standard Windrider, and the twin-linked shurikens for a shuriken cannon.